WILLEMSTAD - The preliminary visitor statistics collected by the CTB show that 40.496 stay over visitors arrived in Curaçao in August 2014. A 4% growth in stay over arrivals was registered in August. In 2013 CTB recorded 38.918 stay over visitors in the same month. Most of the visitors came from Europe (37.7%). This region provided a total of 15.268 stay over arrivals compared to the 14.451 recorded in August 2013 thereby recording a 5.65% increase. The main producing country, the Netherlands increased by 5% to a total of 11.686 in August 2014. The South American region registered 14.471 stay over arrivals in August 2014. A percentage growth of 14.48%; in absolute numbers representing 1.830 more visitors. Venezuela registered positive numbers with 9.697 stay over arrivals. The main reason for the positive performance is that the seat capacity from Venezuela is now comparable with the capacity in August of 2013 when we counted 7.893 stay over visitors. This year’s performance is good for a 23% growth. Brazil and Colombia registered respectively a 13% and 31% increase in visitor arrivals. 12.7% of the visitors in August 2014 are residents of the North American continent. Stay over arrivals from North America decreased by 19.66% in August with a total of 5.157 visitors compared to the 6.419 visitor arrivals of August 2013.
arrivals numbers from Aruba, stay over visitors to Curaçao from the Caribbean region decreased by 9.28% in August 2014. A total of 3.615 visitors were counted. Curaçao North Sea Jazz Festival Visitor Arrivals In the below table CTB shows the CNSJ visitor arrivals by day, compared to the same period of last year. 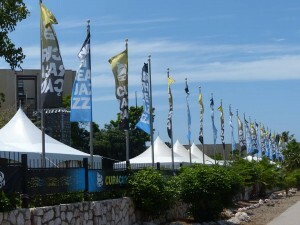 Ten days, including the festival days are analyzed in comparison to last year. A total of 14.475 visitors were welcomed during this period, recording a 12% increase in visitor arrivals. As of Tuesday August 26th the table shows that the number of arrivals is greater than last year. Thursday and Friday are mostly visitors from Aruba and Venezuela, the two main countries that were in Curaçao for the CNSJ festival. A more in depth research of the economic impact of the festival will be published later this year by the University of Central Florida. registered 80.111 South Americans and 45.172 North American visitors during the first eight months. The Caribbean region decreased by 14%, during the first eight months of the year and we welcomed 22.765 visitors from our neighbor islands. Utilizing the ‘Turistika Model’, CTB and MEO calculated that for the first eight months of 2014 the tourism sector was directly responsible for generating $267.5 million US dollars into the local economy. Last year the same period generated a total of $265.0 million US dollars. European stay over visitors, who visited Curaçao in greater numbers during the first eight months of 2014, spent a total $124.4 million US dollars, about 46.5% of the total. They were followed by the South Americans who spent $68.3 million US dollars and the North Americans who spent $48.1 million US dollars. The Caribbean visitors spent a total of $15.1 million US dollars in 2014. All together visitors stayed 2.573.260 nights in Curaçao compared to 2.457.852 nights in the first eight months of 2013. An overall growth of 5% year to date. The information gathered from the Embarkation/ Disembarkation Cards in the first eight months of 2014 shows that 67.3% (193.386 visitors) of the stay over visitors stayed at a registered accommodation. The share in large hotels, small hotels, bungalows, apartments and guesthouse is respectively 31.3%, 13.5%, 15.6%, 6.1% and 0.9%. The number of visitors that stayed at a non-registered accommodation type is 93.937. This is 23.7% of the overall arrivals.